The SZD 56-2 is a new 15-meter Racing Class sailplane that was evolved from the previously tested SZD 56-1 Diana 1 15 meter wingspan flapped sailplanes. This sailplane's competition performance history is impressive. Sebastian Kawa won the 2005 Sailplanes Grand Prix Race in France with it, Janusz Centka did likewise in the 15-meter class at the 2006 World Championships in Sweden. The Diana 2 utilizes highly reclining cockpit seating and a right cockpit side control stick, as did the earlier Diana 1. The workmanship and detail design of our test sailplane were outstandingly good. Its white lacquer painted exterior surfaces were beautifully smoothed, polished, and waxed. The wing area is only about 93 square feet, and its aspect ratio measures about 26, which is very high for a 15-meter sailplane. Its wing airfoils are reported to be a thin new highly laminar KL-002-128F/17 design at the root, and a KL-002-122F/17 at the tip. The wing is equipped with one-piece flaperons on each panel, and each flaperon is equipped with 2 small NACA type ram-air inlets designed to feed blow-hole turbulators located on the flaperons bottom sides. This is excellent new light-weight carbon and aramide fiber epoxy bonded composite sailplane. Its empty weight as delivered with 4 small (2.25 in diameter) basic instruments was only 397 lbs. Adding radio, more instruments, and 2 batteries increased our flight test empty weight to about 420 lbs. Most controls connected automatically during assembly, but the flaperons and elevator connected manually with reliable Polish hooks that were secured by spring-loaded sleeves. The Diana 2 has now been in production for about 1.5 years and has a European Type Certificate for the JAR-22 Utility Class (non-aerobatic). Our test sailplane was FAA licensed as experimental, as are many US racing sailplanes. We were fortunate in that Jerry Zieba, the Diana dealer from Illinois, offered to bring his new Diana 2 to Caddo Mills for the Dallas Gliding Association’s flight-testing. He kindly allowed Dean Carswell, Jeff Baird and me to use his sailplane for flight-testing and evaluation. We made a detailed inspection of this sailplane, and were impressed with both its workmanship and very good quality. The wing surface waviness was very low, averaging well below the .004inch limit that I believe to be needed to achieve extensive low drag laminar flow on sailplane wings. Its epoxy/carbon fiber composite construction appeared to be quite strong, and its empty weight fully equipped with factory winglets, instruments, and two batteries was unusually light at about 420 lbs. That made it very easy to move about the hangar and airport. The details of its construction were all very well done. The exposed metal fittings were nicely cadmium plated for enduring rust protection. Its retractable main landing wheel is a relatively small 4.00 x 4-inch Tost unit that is equipped with a standard drum brake, the same as with my Ventus A. The difference is that the Diana’s landing wheel is well sprung with a knuckle pivot joint and spring shock absorber system that nicely help smooth the takeoffs and landings on rough surfaces. A word of caution about the landing gear extension and retraction system operation is warranted. It is a good and well-designed system, but a bit different from most of the other sailplanes I have flown. The cockpit actuation handle moves forward for gear up, and aft for gear down, like many other sailplanes, but there are no visible detents in the cockpit side floor below the handle. Instead, the landing gear actuation handle is equipped with a spring-loaded lever on its forward side that securely locks the handle in either its gear full extended or gear fully retracted positions. When retracting the landing gear, one must squeeze the locking lever, to unlock it before the landing gear handle can be moved forward to retract the wheel. Then one must release the spring-loaded locking lever so that it can then catch its gear-up lock detent when the gear handle is pushed fully forward. The reverse is true when lowering the landing gear. The landing gear handle needs to be moved aft rather swiftly to ensure that the down-lock engages its detent properly. It is then prudent to check that the gear is locked down properly by trying to move the gear handle forward without squeezing lock actuation lever. If you can then move the gear handle forward at all, the gear is not locked down. If so, then you need to push the gear handle part way forward, and then slam it fully back, while being careful that the spring-loaded locking lever is free to find its locking detent. The aft end of the fuselage is equipped with a small 4-inch diameter solid plastic tail wheel. It rattles a bit when landing and taking off, but works OK. The towhook is installed on the fuselage bottom side about 2 feet aft of the nose. The towhook mechanism on our test sailplane did not have an automatic back-release capability; therefore it was placarded for aero towing only. 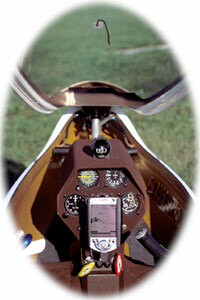 The Diana 2 airspeed system uses a fuselage nose pitot tube that is located in the cockpit ventilation air inlet. Small vent holes in the fuselage nose sides serve as its static sources. First we checked the pitot and static system lines for leaks, and found none. Then, while inside the hangar and out of the wind, we calibrated the sailplane’s Winter airspeed indicator by carefully comparing its readings to our calibrated reference ASI meter. The errors that we measured for the sailplane’s Winter ASI were relatively low, less than about 2 knots over our entire planned flight test range. Those measured airspeed indicator instrument error data are shown in Figure below. I then made our airspeed system flight calibration with two 11,000-foot high tows. The sailplane was equipped with a trailing bomb static reference, deployed in flight after tow release, and a Kiel tube reference pitot temporarily taped to one side of the canopy. The flight test calibration was then steadily flown at indicated airspeeds of 35 to 120 kts, comparing our master reference indicated airspeeds to those of the sailplane’s. The wing flap settings used were those recommended by the sailplane’s Flight Handbook. They varied from +28 degrees at 35 kts to –2 degrees at 120 kts. Those test data were then used to compute the Diana 2 airspeed system errors versus indicated airspeed. The Figure below chart presents the flight measured Airspeed System errors. There it is assumed that the airspeed indicator has no errors. The Diana’s airspeed system measured errors appear to be small, and generally about 1.5 kts or less over the entire 40 to 120 kt IAS test range. In general, our test data measurements show that the Diana 2 is actually flying about one knot faster than the indicated airspeed, which is very good. While the fuselage nose side static pressure orifices provide a good static pressure source, they are subject to clogging when flying in rain. For that reason a pneumatic switch of some kind should be installed, and teed into the sailplane’s static pressure line so that the pilot can switch to an alternate static source if and when clogging occurs within the basic static pressure line. Venting the alternate static pressure source to the cockpit usually provides a relatively good static reference pressure, and I have used that a number of times in the past. For these tests we had to wait until the atmosphere became relatively calm with little vertical air motion or horizontal wind shear at the flight test altitudes. It had been a windy and dry fall season in Texas, but finally on the 7th of November the atmosphere became acceptably calm for a few days of flight-testing. Six high tow test flights were performed to measure the Diana 2 sink rates at various airspeeds. The wing flap settings used were those recommended by the sailplane’s Flight Handbook. They varied from +28 degrees at 35 kts, to –2 degrees at 120 kts indicated airspeed. A total of 96 sink rate measurements were made, two by Jeff Baird and 4 by me. Of those 96 sink rate data points, only 4 needed to be discarded because of their excessive scatter. The remaining 92 sink rate test data points from these 6 flights were then averaged at each test airspeed. They were then corrected to the sea level 59 deg F standard atmosphere air conditions, and then shown plotted in Figures below. A minimum sink rate of only about 100 fpm is indicated at 35 to 40 kts. Figure below shows the corresponding L/D data points. There a remarkable L/D of about 47:1 at 51 kts are indicated. This is the highest L/Dmax we have ever measured for a 15-meter sailplanes! Subsequent thermal soaring tests showed that the Diana 2 climbed very well in our weak Texas November thermals. The above-discussed performances were measured with the water ballast tanks dry. We did not test with the ballast tanks filled. Had we done so, we would have likely achieved another 1 or 2 L/D points because of the lowered skin friction drag coefficients that result from flying at higher airspeeds. The factory had installed full span turbulator blow-holes on the flaperon bottom surfaces, located well aft at about the wing .95 chord location. Wing oil flow test flights were not conducted because of concern that the very small blow-holes might become clogged by the oil. Using our standard 2-inch long wave gage, we made chordwise waviness measurements of our test Diana 2’s wing top and bottom surfaces at 14 spanwise stations along each wing panel,. The magnitudes of the Diana’s wing surface waves were amazingly small, averaging only about .0012 inches peak-to-peak. That is extremely smooth. Only at the wing panel roots, and again near the wing tip top surfaces, did our measurements much exceed that value. Those waviness measurements are for peak-to-peak magnitudes –from valleys to peaks. Those data are shown plotted in Figure below. The Diana 2’s airbrakes and water ballast dump controls connect automatically upon assembly. The elevator and flaperon controls must be connected manually, but that is not difficult to accomplish because their connections are easily accessible and simple to connect. The cockpit is enclosed by a long forward hinged canopy that extends from behind the pilot’s head to forward of the rudder pedals. I noted that if I wore white shoes while flying, they reflected badly onto the canopy at times; therefore it is better to wear dark colored shoes while flying the Diana. The plexiglas canopy itself has very good optics, except for a minor distortion at its very front end. The cockpit forward and sideward visibility are excellent, thanks mainly to the low cockpit side rails and the wing flaps that allow the Diana to avoid flying in a nose-up attitude at low airspeeds. The cockpit fitted me well, but larger pilots will likely find it a bit snug. When flying the Diana, the pilot needs to rest in a more-reclined body position than I am used to, but not as much so as the older Swiss Diamont sailplane cockpits required. In any case, the well-reclined pilot’s body position was comfortable, but it took a while to get used to. The cockpit seatback is ground-adjustable, and the rudder pedals and headrest are adjustable in-flight. My 155 lb weight and 70 inch height needed the seatback to be positioned near its aft limit when wearing a parachute, but the rudder pedals were set nearer to their mid-position. Tall pilots will likely need to remove the seatback entirely. I have been happily flying my Ventus A that way for years. The Diana 2 is easy to fly, and it handles well. Its stall characteristics are surprisingly gentle, with almost no tendency for the sailplane to drop a wing during my low airspeed maneuvering tests. My 45-to-45 degree roll rate measurement test showed about 4 seconds at 50 kts, but I am not sure that I had the control stick fully deflected. I found the side-stick aileron control forces are a little higher than my Ventus A at thermalling speeds. They increased considerably at high airspeeds; but maybe that is a good feature to help prevent pilots from over-stressing the wings at high airspeeds. The wing root spar arrangement is unusual in that both the left and right hand spar stubs are permanently attached to the fuselage. The wing panel roots have sockets that fit onto the fuselage mounted spar stubs. The oval shaped monocoque fiberglass trailer is strong but light in weight with a low slung and attractive appearance. The ends of the wings are cradle mounted, and their trailer forward-end cradles roll on rail guides. When removing or stowing the wings, one needs to only enter slightly into the rear entrance of the trailer. The fuselage is stowed on a wheeled dolly that also serves as the fuselage support when assembling or disassembling the sailplane. Each wing panel weighs about 100 lbs, and is equipped with 2 large integral water ballast tanks. One water tank is located in the forward portion of the wing panel, and one is located in the aft portion. Their combined total capacity is listed as 65.5 US gallons, or 547 lbs. Also, a 1.5-gallon tail fin tank is provided to optimize the flight CG, when and if needed. To fill the wing tanks, a unique fiberglass dual funnel is provided that connects to both the forward and aft tank wing bottom surface outlet valves simultaneously. This loading funnel assembly rests securely on the wing upper surface, and commendably no hands are needed to stabilize it when loading water ballast. A single rubber stopper is provided in the dual outlet funnel, such that the pilot can choose to load water into either the forward or aft tank separately; or leaving the stopper free, both tanks are loaded simultaneously. 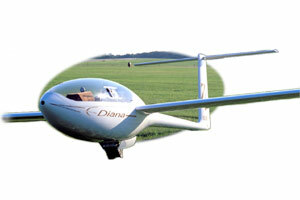 The Diana’s airbrakes are Schempp-Hirth type double plated wing top surface only units. They perform quite well in flight. However, care must be taken to not open them abruptly at high airspeeds. As with most sailplanes equipped with powerful top surface only airbrakes, their rapid extension above about 70 kts causes a strong reduction in wing lift. That is sometimes sufficient to put the pilot’s head through the canopy if he is not tightly strapped in. Sailplanes equipped with both wing top and bottom surface airbrakes are much more benign in that respect, in that they do not appear to exhibit any significant delta “G” effects when the airbrakes are extended suddenly at high airspeeds. The early winter thermals that existed during our Caddo Mills flight-testing were weak, but we were able to easily soar it at the end of some of our test data runs. During that limited weak thermal testing, I thought that it thermalled well, and its 100 fpm minimum sink rate served me well. Dean Carswell performed the sailplane’s flying qualities testing. He was able to also evaluate the Diana’s thermalling flight characteristics, and he will present his evaluations separately. The current price of the new Diana 2 is EU 64,000, plus trailer, instruments and shipping. The instruments, water ballast filling funnels, seat-back, and other auxiliary items are currently not included in the sailplane’s basic price. The beautiful light-weight fiberglass trailer adds 11,950 EU to the price, and that includes all of the needed trailer support fittings and cradles, and the clever fuselage support jack fixture. For more options contact Jerry at jerryzieba@dianasailplanes.com, and/or look at www.dianasailplanes.com. for additional pricing and details. The new Diana 2 sailplane is, in my opinion, an excellent new sailplane for competition and racing. Its light empty weight makes it easy to assemble and handle on the ground. It appears to be of high quality in design, construction, and finish. Its powerful Schempp-Hirth type airbrakes are easy to operate and provide very good landing approach control. Many thanks go to Jerry Zieba for bringing his fine new sailplane 950 miles from Illinois for our flight tests in Texas, and to the Dallas Gliding Association for providing both the hangarage and the high aero tows needed to accomplish it. Also to Southwest Soaring’s manager, Leslie Hamm and her Caddo Mills tow pilots, David Cheek and Howard Hughes, who did the excellent towing. They usually required only about 18 minutes to tow The Diana to 12,000 ft AGL with the powerful Pawnee. “Whoever designed this will never be accused of copying anybody or anything,” proclaimed fellow glider pilot Bob Backer, visiting while the Diana 2 was being readied for its’ first flight. That is what attracted me to the Diana 2 – it is a total departure from convention. Decades of designing/building/flying both R/C gliders and hang gliders helped me to appreciate the unique design concepts applied to this little racer. I like stuff that is different. I picked it up in Galveston, TX in the middle of June, saving about $1000. in shipping costs and two weeks in time. Got it home, filled the panel, got the paperwork done and flew it June 31, 2006. As of this writing, I have 28 flights and about 100 hours in it. Here’s the story. Before I bought it, my main concern was, “Can I fit in it?” It is a tiny little thing! The first time I pulled out the fuselage, I thought it was an 80% scaled R/C model. But, at 5’ 10” and 175lbs I do fit comfortably in it with my chute. The critical dimension is from your tailbone to the top of your head. If you have short legs and are my height, you may not fit. This is an all out racer with no extra anything, including room. However, I’ve done a 6 hour 45 minute flight and was very comfortable. I’ve flown side stick before and the only problem with side stick is thinking about it before you fly. Once in the air - no problem. The pilot position is more reclined than anything else I’ve flown, and it did take a short while to get used to flying so reclined. The pilot manual doesn’t call for negative flaps for takeoff, but I’ve found that does really help. The rudder has a pretty high aspect ratio, and is not very effective while the tail is on the ground. Once the tail comes up, all is well. Add positive flaps and a view of the towplane fills the canopy and it is airborne. I’ve done one flight with water ballast. I filled the front tanks in the wings – 43gallons/344lbs plus another 12lbs in the tail, put me at just under 1,000lbs (1102lbs max) and got the wing loading up to 10.6lbs sq ft. (dry it is about 6.7lbs sq ft) Once off tow, it transformed into a rocket. I felt like I was strapped inside a runaway locomotive. August 29th, 2006 was a great day in SoCal, and SeeYou showed two segments over 170 miles with no turns and average speeds 113 and 116mph. Landings are easy. I use the +21 flap setting rather than the +28 because of the wind we usually have at Warner Springs and also to keep the ailerons more effective while dealing with the normal crosswind shear, thermals and turbulence on final. Wheel landings are the norm – touch down, add full spoilers, put flaps full negative, hold the tail off, roll to stop. Janusz Centka 1000 km triangular ! Janusz has flown SZD 56.1 - Diana, N256DS, "ZJ"
The forecast looked good for July 30, 2002, so early that morning I got ready for my 1000 km flight. Kempton Izunu, the weather guru in Nevada, suggested a triangular task with the first turn at Jackpot, 300 km north of Ely. But, because of the smoke from many forest fires in California, I chose a new second turnpoint, 300 km west of Ely.I launched at 11:15 AM, and made a perfect start at 11:30. My first thermal, a 9-knotter, took me to 15000 feet MSL. The early thermals on course were mostly 8 knots, but as fast-moving cirrus arrived from the west, the thermals gradually weakened, forcing me to fly left, and then right, of course. At one point, I had to deviate 15 miles off-course, where I finally found a 5-knotter and climbed to 12000 feet MSL above the first turnpoint.On the second leg, the weather improved, and I was able to fly cloud streets in 15 to 20 mile segments without circling. After about 60 miles, the cirrus again made its presence felt. Inter-thermal distances increased as good lift became progressively harder to find, and I had to make do with 5 and 6-knot lift. Then Cu Cong began to form nearby, along with scattered showers. Finally, with 60 miles to go to the second turn, things suddenly looked much better. I found a 10-knot thermal and climbed quickly to 17000 feet MSL. With good cu’s ahead, I reached the second turnpoint a full hour ahead of schedule. On the last leg, I flew too far north, and missed a nice cloud street south of course. I was forced to fly through rain under the dissipating Cu Cong. Luckily, I found lift on the edge of light rain, and was able to make my final glide. Having finished ahead of schedule, I considered flying a longer task, using a third turnpoint. But the terrain around Ely had quit working, so I landed. It was a magnificent flight for me, and flying Diana was a big pleasure . It is a great glider. I had the good fortune to pilot the first new production Diana at the Uvalde 15 Meter Nationals and would like to offer a recount of my impressions of this aircraft and how it performed against the best pilots and sailplanes in the United States. Mr. Jerry Zieba of Diana Sailplanes contacted me in April and kindly offered Diana "Zulu Juliet" for me to fly in the 15M Nationals at Uvalde. This aircraft would be the second production model Diana, but the first aircraft produced by the newly formed Bogumil Beres facility. The aircraft was finally shipped from Gdansk on 4 July. Jerry picked it up in New York harbor on July 23. After a whirlwind of driving and paperwork, Jerry miraculously arrived with the Diana at Texas Soaring Association on July 29th. With no time for preparation and practice, I arrived in Uvalde on 1 August, and conducted four practice flights prior to the competition. These flights culminated with a winning speed of just under 100 mph on the second practice day. My initial impressions of the Diana were quite positive! As most people know, the trailer and assembly procedures are a bit unusual in that the spar stubs are fixed to the fuselage instead of to each wing. Substantial carbon fiber spar stubs protrude about 30" beyond either side of the fuselage. On assembly, the fuselage is first rolled out of the trailer on a dolly which, by means of a clever hydraulic jack, keeps the fuselage spar stubs above the trailing edge of the wings. Upon removal of the fuselage from the trailer, the ship is lowered until the main wheel is just on the ground. The wings are then extracted from the trailer keeping the leading edge of each wing above the fuselage spar as they are rolled out. Some care is required to ensure that the wings are held sufficiently high to avoid banging the spar stubs. However, this unusual practice readily became routine and was aided by the extreme light weight of the wing panels (approx 100 lbs ea.). As mentioned by "OC", handling of the wing root is a challenge for the beginner in that there is no spar stub to hang onto. Certainly, either technique or some type of handling aid would take care of this. Overall, assembly is straightforward and is aided by the light weight of the components. The quality of the components, fit and finish was at least equal to the very best of the German ships. I ran my 2" wave gage over the wings and could not find any noticeable sign of waviness. "Optically", the wings were near perfect. However, the trailing edge of the left spoiler did not seat perfectly. This condition seemed to disappear in flight. The all-carbon construction gives the ship a very solid and robust feel throughout. The cockpit is well laid out with the side stick on the right and all other controls accessible by the left hand. There was never a need to "shift" hands in flight as with some gliders. Actuation of the full span flaperon was smooth as silk throughout the flap range. I "really" liked the side stick. Actuation was smooth in both axis and seemed to cause less fatigue on extended flights than a standard stick. However, the Diana's ultrahigh roll rate does demand a relatively smooth and precise technique. The cockpit is significantly more reclined than the typical racing class ship. However, I would not describe it as "cramped". Leg room is a limiting factor for pilots in excess of 6' in height. However, shoulder, hip and elbow room were all much more generous than my Discus A. The in-flight adjustable headrest was a nice feature. However, another inch or so of leg room would be nice for taller pilots. As mentioned on the NG, I did fly most of the contest barefoot. This did provide a little extra leg room, but more significantly, my white tennis were causing very distracting reflections. A good pair of darker colored deck shoes would have solved this problem without compromising leg room. Ventilation is good with a high volume demister in the nose as well as an "aimable" vent located on the cockpit sidewall near the control stick. I did note that the nose vent, if left in the full open position, becomes unacceptably loud over about 80 kts. However, when the flow is "throttled back", for higher speeds, it provides adequate ventilation and is very quiet. Visibility in the Diana is outstanding. With the reclined seating, forward and upward visibility is excellent. Behind, you can see the horizontal and up front, a quick rock of the wings easily reveals any hazardous traffic which may be ahead and directly below. In flight the Diana is very pleasant. I have never flown a glider with such low adverse yaw characteristics. Full rate (ie. 3 seconds - 45 to 45) rolls into thermals can be done with only 2/3 rudder. The resulting maneuverability provides a competitive advantage in centering and rolling in and out of thermals. The Diana offers the option to roll 90 degrees into a turn, change your mind and roll back onto course without delay or significant penalty. ZJ" was recognizable to other pilots from some distance simply by the extremely agile manner in which the glider maneuvered. Performance: Based on my experience in Uvalde, the Diana was equal to the best of ASW-27's and V2's throughout the envelope. The ship did seem particularly good in the important 90 to 110 knot range. On one particular 55 mile, 110 knot, dead heat final glide, the Diana beat a heavy '27 home by a comfortable margin. The Diana is limited to 10.3 PSF, which was perhaps a small disadvantage in Uvalde. Another pound or so would have been nice under some of those incredible cloudstreets. Thermalling is a joy because of the maneuverability, visibility and turn radius. 48 to about 53 knots seemed to be about right at gross weight. In the larger gaggles, I could sometimes core the thermal in a much smaller diameter and outclimb many of the ships. I never once had the sense that any other ship, including the V2, had any advantage in climb. I often ended up on the top of the weak pre-start gaggles supporting my opinion that the ship would be excellent in light conditions. The contest stats show that I was within a few tenths of 1% of the winner's score on the AST days, but was about 5% off the mark on the PST's. My continuing PST brain disconnects dropped my overall ranking on the final day from 3rd to a still respectable 5th. Certainly, the Diana can drag race with the best of them! Thanks again to Jerry Zieba for entrusting me with his beautiful sailplane! David Mockler aka Discus Driver "2XX"